In the recent years, Japanese Heavy Industries have received a number of strategic projects including the development of a modern, large and stealth-capable submarine. The Soryu (or Sōryū-class with the Japanese language sounds) submarines have a power system based on diesel-electric components. The submarines seem to be classified as attack submarines, a curious fact since usually the JMSDF and other branches of self-defence forces do not possess offensive weapons. However, in the case of submarines it is difficult to distinguish between the boundaries. 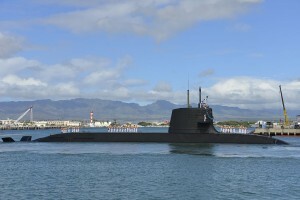 The first submarine of this class had being commissioned by the Japan Maritime Self-Defense Force in 2009. These submarines have technologically evolved from the design of the Oyashio-class submarine. When navigating on the surface, the new class of Soryu submarines can be clearly identified by a characteristic X-shaped tail planes. and 8,000 hp (6,000 kW) submerged. The speed is on surfaced 13 kn (24 km/h; 15 mph) and when submerged: 20 kn (37 km/h; 23 mph). The Range is 6,100 nm @ 6.5 knots and the complement (crew) consists of 65 (9 officers, 56 enlisted). The class uses a new system with air-independent propulsion. This system relies on Kockums stirling engines license-built by KHI (Kawasaki Heavy Industries). The main feature of the system is that they can stay submerged for longer periods of time. Some rumors indicate the new units may use more advanced banks of Li-Ion batteries instead of air independent propulsion systems. The armament consists of 6×HU-606 21 in (533 mm) torpedo tubes with 20 reloads for: 1.) Type 89 torpedoes and 2.) Harpoon (missile). There is a price for this exceptional capabilities: its cost. for example, the sixth submarine (Kokuryū) is estimated at more than 500 million USD. The origin of the naming for the Japanese submarines has changed since World War II. At that type they used ocean currents. The Soryu class is related to mythological creatures. For example, Sōryū means blue (or green) dragon in Japanese. Intriguingly, this was the name of an aircraft carrier of the IJN in the secon world war!. Few days ago, a flat-top Helicopter destroyer DDH-184 was named Kaga, as one of the carrier of the IJN. Interestingly, Kaga and Soryu joined the Midway battle in 1942, and both were sunk. We do not know why previous naming of carriers were assigned to a new submarine though! but Soryu name has been related to the navy for that reason.